Second part of the report on funding of Compassion International, an international NGO involved in evangelism under the pretext of Child Welfare. In the first part of the exposition on the activities of “Compassion International”, we learnt how the ‘charity’, which is headquartered in Colorado, USA professed its Evangelical agenda in its US tax returns. We learnt how it has been sending ~Rs. 220 Crore each year to FCRA-NGOs in India. We learnt about the two of its primary affiliates in India — Caruna Bal Vikas (CBV), Chennai and Compassion East India (CEI), Kolkata. We also learnt of the names of the Trustees of these two FCRA-NGOs. We learnt that our Ministry of Home Affairs has put this Colorado entity on the Prior Permission List, which means that its donations to any FCRA-NGO in India will not be automatic, but will have to be approved by MHA on a case by case basis. In the present article, let us briefly look into the secondary recipients of donations from Compassion International, through its primary affiliates, CBV and CEI. As discussed earlier, FCRA-NGOs have to spend their foreign “donations” either by themselves or they have to, in turn, give it to other FCRA-NGOs to spend. They cannot give it to entities, which are not FCRA registered. So, CBV and CEI, like countless other FCRA-NGO behemoths that plague our nation, distribute the funds they receive from Colorado to other FCRA-NGOs. In Part-1, we saw a long Table containing names, registration number, and address of every FCRA-NGO, which has ever received money directly from Compassion, Colorado. Now, let us look into the details of the secondary recipients, which are themselves FCRA-NGOs. 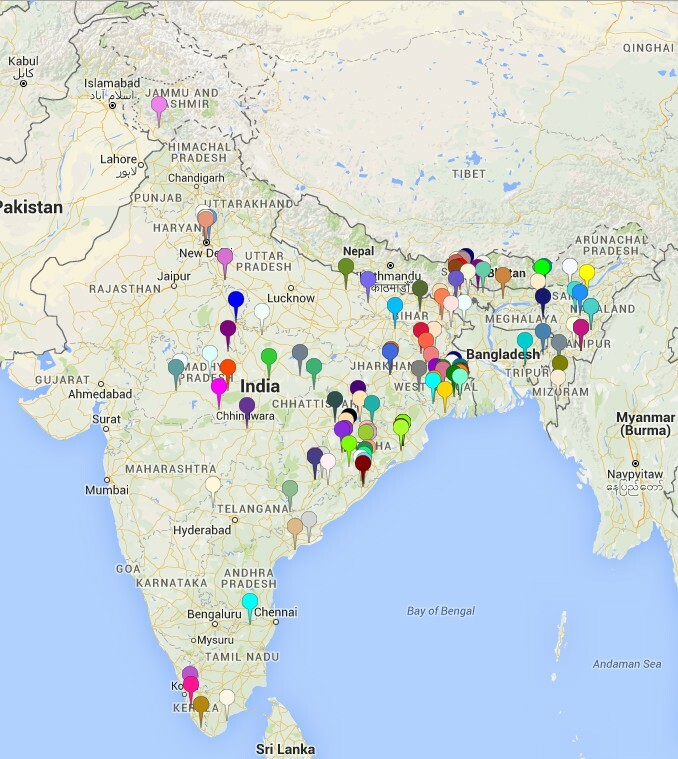 136 FCRA-NGOs are listed in Map-1 (secondary recipients of CBV) and 132 are listed in Map-2 (secondary recipients of CEI). The list was constructed out of FC6/FC4 returns filed by FCRA-NGOs in the years 2012, 2013 and 2014. Map-1 includes six FCRA-NGOs, which have not been secondary recipients of CBV, but have received funds directly from Compassion-Colorado. These six were part of the list presented in Part-1 of this series. 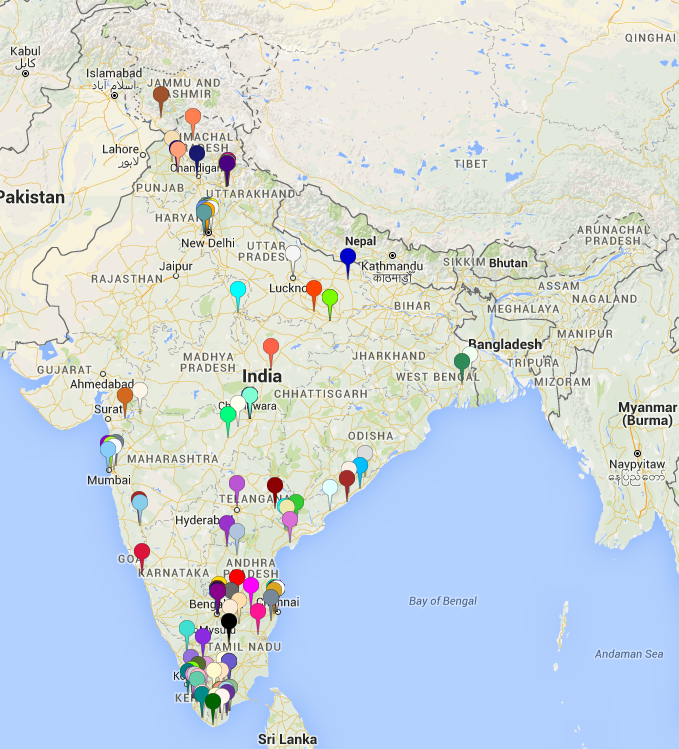 The links to the XS maps (with pins on locations of each FCRA-NGO) is very useful. We suggest readers to check out the dynamic maps. Caruna Bal Vikas, Chennai appears to “take care” of Kerala, Tamil Nadu, Andhra Pradesh, Telangana, Maharashtra, Uttar Pradesh, Uttarakhand and Delhi. Compassion East India, Kolkata appears to “take care” of West Bengal, Assam, Mizoram, Manipur, Meghalaya, Nagaland, Arunachal Pradesh, Tripura, Chhattisgarh and Jharkhand. Thus, there seems to be a nice “division of labour” among the two. A clear Eastern Coast focus is seen among the FCRA recipients from Compassion. This character is true for several evangelical organizations funded via FCRA. Apart from changes in religious demography, such an Eastern Sea Board focus does not augur well from a strategic security perspective as well. The discerning readers are encouraged to explore this thought process further. Both CBV and CEI have operations in Madhya Pradesh. Also, both seem to be funding an isolated activity in Udhampur. Every information that is presented here is verifiable and is based on data that are in public domain at the FCRA website of the Government of India. FCRA Wing, Ministry of Home Affairs is thanked for providing annual returns of all FCRA-NGOs since 2006, online, without one having to go through the RTI route. Google and the mapping tool (theXS) are immensely thanked for making this work a pleasurable activity. The report has been prepared by the admins of FCRA-Analysis blog.